Every few years there is a producer or entrepreneur who wants to prove reality wrong, who wants to do the impossible and make a business bringing small beautiful productions of poetry to the people. I’m thinking of Harvey Kubernik in Los Angeles who produced poetry compilations on Freeway records and later on New Alliance, where he recorded the best of the Los Angeles poetry scene, bringing us the recordings of Wanda Coleman, Exene Cervenka, Michael C. Ford and dozens more. There was also Gang of Four with its releases of Spalding Grey, Linda Barry and Andrei Codrescu. On the East coast there was Bob Holman and Mouth Almighty Records, a short-lived imprint on Mercury records. 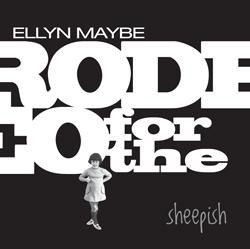 Ellyn Maybe’s latest disc Rodeo for the Sheepish comes from a similar adventure. Put out in 2010 on the Hen House Studios label, it was produced by Harlan Steinberger, who also did the music for the disc (along with Tommy Jordan, who provided back-up vocals). Hen House has put out a number of poetry discs including a new DVD tribute to Kenneth Rexroth entitled The Signature of All Things, and a recent compilation of baseball themed poems entitled The Los Angeles Bards – Live In Pasadena (CD). Ellyn Maybe, as the story goes, got her moniker from the sign-up sheets at open mics. Always unsure, she’d sign up as Ellyn with a “(maybe)” added to indicate that she might not read when the time came. The name stuck and Ellen Maybe is now one of the premier performance poets in Los Angeles. Her work is praised by Henry Rollins, Jackson Browne and Greil Marcus. Her band will be performing at the prestigious Glastonbury Festival in June 2011. Rodeo for the Sheepish is strikingly well produced and recorded. The delicious choral work of Tommy Jordan and musical arrangements of Steinberger rival the best. Each of Maybe’s readings is held within its own music frame, sometimes pop influenced, sometimes rythym and blues, sometimes motown. The music doesn’t overwhelm but melds with the work, providing a smooth rendering of the affective landscape and nice ornament to the texts. It’s evident that Ellyn is very smart. She has seen every film at the Los Angeles Cinématheque from Rhapsody in Blue to 400 Blows and the director’s cut of Heaven’s Gate. She has studied art history from the renaissance to the moderns. She knows the lyrics of the hits of Barry Manilow, ABBA and the GoGo’s. She sends her shout-outs to Sylvia Plath, Anne Sexton, Heinrich Ibsen, Allen Ginsberg, Jack Kerouac, Vincent Van Gogh, George Harrison, and dozens others. I got the feeling Maybe’s persona has listened to that record many many times. There’s no indication of Maybe’s birth name on the disc nor is there a current picture of her, but on the cover and on the inside fold there is a photo of a young girl perhaps six or seven years old. Persumably this is Maybe in her childhood home. The girl looks as though she’s walked off the set of Mad Men, with her tortise shell glasses and kneehigh socks, standing in front of the fire place in the living room of a suburban home somewhere in the arid heart of America. This child is the master of her realm, at ease in her child’s designer dress staring into the camera. But something happened in the intervening years. The poems in “Rodeo for the Sheepish” describe a trail of tears that led from the security of that surburban home to the streets of Venice, California. In her strong reading of “City Streets” Maybe’s persona recalls the souvenirs of an adolecence, where she is slowly crushed by constant humiliation and its banal and everpresent emotional violence. This violence turns her against her own body image. Maybe’s voice still resonates with fear and vulnerability, we feel it as we listen to the disc. But she has also transformed this humiliation and suffering into gleaming sword and shield. She has confronted her demons, faced them head-on, and now she can tell us the story of how she slew her dragons. In her other universe, the one we live and work in, other people scream “fat chick” incessantly. They rip people off emotionally, financially and spiritually and they walk away to do the same to a hundred others. Justice in Maybe’s world comes after, when the verses of Plath or the repartee of Oscar Levant are handed down to those few who keep their flames alive. That is what Maybe is doing on this disc, she is keeping it alive.